Why did we plant Zinfandel? I ask myself that question many a time when I am marooned in the Zin section of the vineyard, cutting off bunches, thinning leaves only to have to repeat the process two weeks later. We planted it because we love the variety. We first tasted it in California while visiting our daughter, Liz who was resident there at the time. We were overwhelmed with the taste of this, to us at that stage, ‘new’ wine and decided then and there, to plant it. However, in spite of the hefty demands on our time in the vineyard we do not regret it and enjoy introducing visitors to the cellar door to the joys of Zinfandel. Widely grown in California now, Zinfandel was introduced to the United States almost 200 years ago. However new DNA research has proven it to be identical to the Italian grape Primitivo and also genetically linked to the Croatian grape called Crljenak kastelanski (sirl-yen-ack kastenlanski). It is now known that Zinfandel originated on Croatia’s Dalmatian coast. It probably found its way to the Americas in the early 1800s, when Croatia was part of the Austro-Hungarian Empire, via cuttings of Crljenak taken from the palace gardens in Vienna. Surprisingly, for such a flavoursome wine, Zinfandel is little grown in Australia, perhaps because it requires intensive vine and bunch management to achieve its optimum potential. It is a high alcohol wine, around 15% usually, and as such can cause issues in the winery. Despite this, there are several fine examples of Australian Zin that rival the best of this variety produced in California. 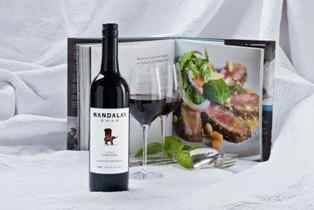 At Mandalay Road we take the time and care to produce a really good Zinfandel. So if Zin is your thing, drop in and taste, call or order online . Zinfandel pairs beautifully with Italian dishes, pastas, pizzas, veal and lamb, all taste even better with a glass of Zin in hand. The more full-bodied Zinfandels bring out the best in hard, aged cheeses as well as being a wonderful adjunct to slow cooked and hearty winter meals. If you haven’t yet tasted Zinfandel, seek it out and give it a try…..You will find a range of styles from the ‘white Zinfandel’, a sweeter version produced widely in California, to the more robust styles that the Australian winemakers favour.